In connection with the ongoing cooperation between the Weltmuseum Wien and the Asia-Europe Foundation (ASEF), and on the occasion of the event series Public Lab, culture360.org interviews Dr. Sri Kuhnt-Saptodewo, curator of the Insular Southeast Asia Collection and the special exhibition Danced Creation. Asia's Mythical Past and Living Present. In this interview, Dr. Kuhnt-Saptodewo gives insight into the underpinnings of the exhibition and event series and their links with contemporary dance performance. She also shares her views on the nature of collaborative efforts and participating in the Creative Encounters programme. The project involves a large amount of people, some involved with coordination, others participating as artists. This calls for good organisation and, more importantly, good communication between the institutions and artists involved. Dr Sri Kuhnt-Saptodewo was born in Jakarta. She studied ethnology at the Ludwig-Maximilian-University in Munich. In 2003, with her habilitation Getanzte Geschichte. Tanz, Religion und Geschichte auf Java at the Humboldt-University in Berlin, she qualified for university teaching (venia legendi) in Southeast Asian studies. 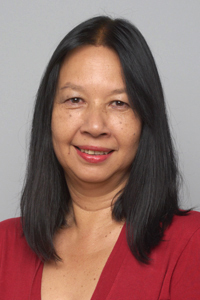 Since 2005 she has been Head of the Insular Southeast Asia Collection, Weltmuseum Wien.